Root Canal Surgery And Apicoectomy - What's Involved? The aim of any type of root canal surgery is to get rid of a source of infection. That's the ONLY reason to carry out ROOT SURGERY. It can't repair a crack in the root. The most common type of root canal surgery is apicoectomy. But first, let's look at why you might need surgery at all. The main reason that a root canal fails is infection. (The other reason is that the tooth fractures.) Infection can get into a root canal if a root filling leaks, or if there's a small defect in the tooth somewhere. One OTHER possible problem that MIGHT be fixed with root canal surgery is where the dentist has accidently made a small hole through the side of the root during the Root Canal Procedure. A specialist ENDODONTIST might be able to repair this small hole with a cement called MTA. THE KEY PROBLEM is that there is some place in the tooth root where bacteria can hide and harbor infection. One of the possible sources of infection causing a Failed Root Canal is bacteria hiding in the root tip. You had the long appointments, the dentist spent lots of time finding all the little spaces inside the tooth and cleaning them. Then he sealed up the roots and the tooth. Everything should be fine. But the tooth doesn't settle down. Even with antibiotics, it still niggles, or is just plain sore to bite on. The usual cause here is a small residual infection at the tip of the root. In the last 3mm of the tip, the root canals can branch out into many microscopic channels. These microscopic channels cannot be located nor sealed up with normal root canal treatment. So if this seems to be the problem, the answer is to surgically remove that last 3mm of root tip. That's what we call an apicoectomy, although it is spelled slightly differently from country to country. In this procedure, after making sure that the area is really numb, a small area of gum over the tooth root is lifted up so that the root is visible. Then the surgeon can carefully remove the tip of the root, and put a seal over the remaining root end. Then he puts the gum back over the root, and fixes it in place with a couple of stitches. When the numbness wears off, the gum is going to be quite tender and sore in that area. The surgeon will probably have told you to expect some swelling, and to take some painkillers. It's important to disturb the gum as little as possible for a day or two, until it starts to heal up. The gum can look pretty nasty there around 2 - 3 days after the surgery, but then it settles remarkably quickly after that. When you go back to the surgeon 7 days after surgery, the gum is usually almost all healed, with just some red marks visible. But it's still healing under the gum and so you should still treat the area very carefully for another week or two. No aggressive brushing! Sometimes the surgeon will give you antibiotics right after surgery. Sometimes he will not, depending on how severe the infection appeared to him at the time of surgery. Antibiotics are not always required. Hopefully, removing the root tip gets rid of the tiny spaces where the bacteria were collecting, and so gets rid of the source of the infection. As the weeks go by, the area should get more and more comfortable, until you realize after a month or so that you've forgotten all about that tooth! What other types of root canal surgery are there? The next most frequent is probably repairing a perforation in the root. The root filling has been well done, but during the root canal procedure the dentist may have caused a small hole in the side of the root. Again, this could be a reservoir for bacteria. The procedure is similar as for an apicoectomy. The area is made really numb, and a small section of gum is lifted from over the tooth root, so that the root is visible. Now the surgeon can see the little perforation. He will clean it and wash it, and then pack it with a special cement called MTA. Then he gently puts the gum back in place and fixes it with 1 or 2 stitches. Healing time will be a bit quicker than for an apicoectomy because no tooth portion is removed. BUT the gum will still be quite sore for a few days! One other type of root canal surgery that can be done to save a tooth is called hemisection. Basically, it can only be done on a molar tooth, where one root is OK but the other root has problems with gum disease as well as root canal issues. In an attempt to avoid complete extraction, it is sometimes possible to remove just one root. The other root is left in place to support the tooth. Obviously, this will not be as strong as a normal molar, but usually it is strong enough to survive. Root canal surgery should be regarded as a last attempt to save a tooth from extraction. 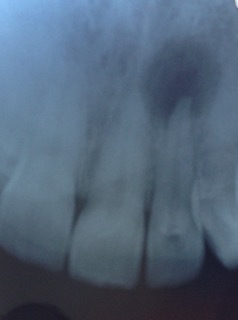 If there are continuing problems after the surgery, then the tooth will almost certainly have to be removed.